Been a bit busy of late. The week can be summarised in one word. Work. On the birding front there has been very little - one mid-week patch visit to see the Firecrests (all four of them), and a quick jaunt this morning out onto Wanstead Flats. You will be pleased to hear that Gull numbers are building up nicely - almost entirely Common and Black-headed, in about equal number. I have, of course, been forced to look at them. More fool me. The other day this one caught my beady eye. It is clearly a Common Gull, but I think it's an Azorean Common Gull. Just look at that streaking! Any Azorean Y-L Gull would be proud to have streaking like that. The bird caught my eye from some way away, and immediately looked exciting. Being a closet Larophile (or should that be phobe?) I remembered having read about an eastern race of Common Gull, one field mark of which was extensive dark streaking on the head. Naturally I couldn't remember anything else about it, or even what is was called. No matter, that's what cameras are for right? Note what? 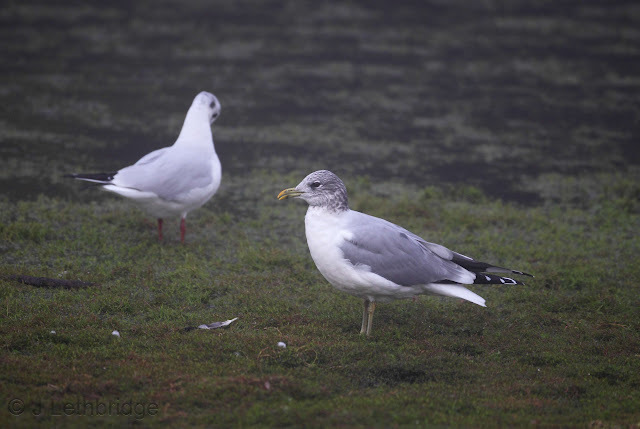 It would be ambitious of me to mention heinei this early in my Gull career (and remember that the Gulls are still winning by some margin), but all I can say is that it stood out by a wide margin whilst still being just a Common Gull. I've also read that the occasional normal canus Common Gull can show streaking this extensive, but this is the first I can recall seeing. I had a look for it this morning in the flock, but it wasn't there. Nevermind. Note that it was a very foggy day, so the photo has come out a bit odd, at least there's another bird in there for comparison though. Gulls - stay well away!